Working at FSM Group gives you the opportunity to kickstart your career. We accept applicants with all levels of experience, because we see our new employees for the potential that they possess. It is a responsibility of ours to bring out that potential and give them the chance to develop professionally. 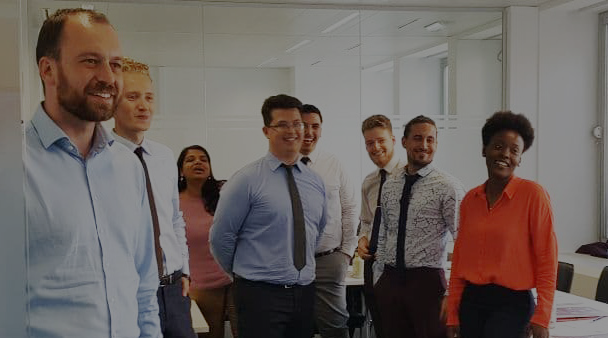 From your first day as a new recruitment consultant at FSM Group, you are welcomed by our training team, the FSM Academy, whose top priority is to best prepare you for your new job. The FSM Academy Sales Trainers give you all the tools needed to succeed and grow. 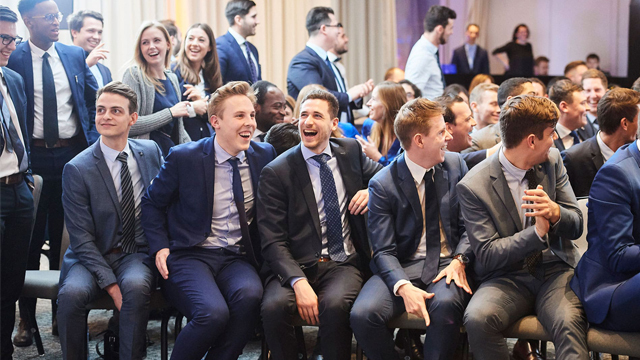 We give each group of new consultants two and a half days of induction training, interactively teaching each trainee the expectations of the job, as well as the foundations of the company itself. 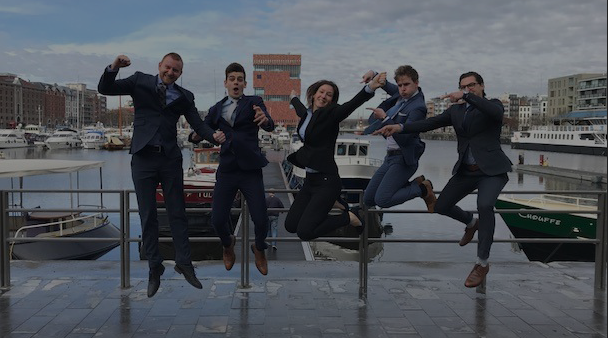 Our values of Fun, Success and Meritocracy are prominent – hence the name FSM Group – and we believe that knowing the evolution of the company and our current culture is crucial as we accept you as one of our team members. 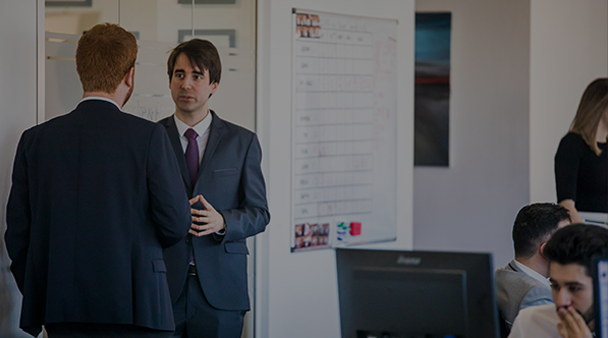 As a recruitment consultant, you begin your new job as a trainee, shadowing the higher level consultants and learning from them as you watch and listen. We firmly believe in the power of learning from your colleagues. For this reason, we work in an open space. This gives each of our consultants (new and senior) the ability to listen, watch and learn from each other. Our consultants are specialised in specific sectors (Finance, Engineering, and Information Technology) and focused even further on niche markets within that sector. In the first 2 months of trainee status, your main tasks are to learn, to perfect the art of sales, and to understand and build your personal market. We believe that it is important to have a solid foundation before becoming hands-on. In all of our brands, our consultants work in pairs which we call “binomes”. Each trainee is paired up with a Senior Consultant so that they can learn something new daily from their binome in conjunction with several training sessions with the FSM Academy. In this way, our newest employees are able to learn rapidly from their surroundings every day and are well-equipped with all the tools needed to succeed. At FSM Group, we constantly set goals and targets for our employees to encourage them and give rewards to those who deserve it. Incentives are awarded to those who succeed as teams and on a personal level, including car targets, holidays, Michelin star restaurants, a Rolex reward, and much more. After 6 months of being hands-on in your market and becoming well versed in the job details of a sales consultant, you receive the opportunity to reach the Senior Consultant status if you hit the set target. From there, you have many opportunities to grow your career and become Team Leader, and Associate, Regional or Brand Manager within the company. We are open to new ideas – you truly have the chance to evolve at FSM Group, whether it be to a higher level position or even to opening new markets or starting new brands yourself. As a recruitment consultant at FSM Group, you will always be faced with challenges designed to push you to become the best you can be. The opportunities are plentiful. Join our team today and discover what feats you can accomplish. THIS MIGHT SEEM LIKE A DREAM, BUT IT CAN BECOME REALITY! LIVE THE DREAM AND JOIN FSM GROUP!